B & R Cycles, Bowflex, PowerSports, Reviews | Comments Off on Is the Bowflex Max Trainer M3 Best Workout Machine for Beginners? Is the Bowflex Max Trainer M3 Best Workout Machine for Beginners? It’s the month of Black Friday 2018 and PowerSports Review Network is coming at you with a new sport equipment guide, this is the time for our just released Bowflex Max Trainer M3 review. Now, if you’re on the lookout for the best workout equipment out on the market right now, then the Bowflex Max Trainer M3 is definitely worth considering. The M3 being Bowflex’s entry-level model makes it the most affordable in their line of elliptical machines. 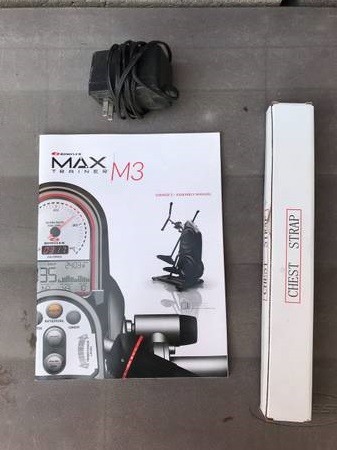 Bowflex Max Trainer M3, Manual and Chest Strap. With Black Friday coming up, offers and discounts are popping up everywhere, so I’m sure you’ll be able to scout the best deals (Bowflex Max Trainer M3 Black Friday deals, specials and coupons codes here). Still, these things don’t exactly go for cheap, so it’s very important to know what you’re getting here and what this machine can do for you. There are many things to consider before making a purchase as big as this one. First of all, how much space are you going to need? Second, will this machine target all the muscle groups that you want to exercise? You don’t want something bulky and complicated in your home that only targets your legs or your arms. I’m happy to say that the Bowflex Max Trainer M3 works wonders as it is designed to give you the most optimal workout. With eight resistance levels, it can challenge everyone from beginners to gym buffs with no problems at all. Bowflex promises a workout so efficient that you’ll only need to spend 14 minutes a day on it to see some results. That’s pretty impressive if you ask me. 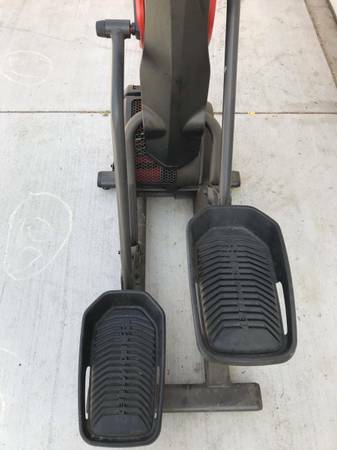 With this machine, it’s very likely that you’ll want to work out for longer because it’s so easy to use and does not put stress on your joints at all. It’s not going to be like working on a treadmill and being weak-kneed for the next couple of days. But let’s get into the details and take a look and see if this is the one you should splurge on when Black Friday comes around. The best part about this machine is that the Bowflex Max Trainer M3 is an elliptical and a stair climber at the same time. This means you could do only this for cardio and you’d be good to go. 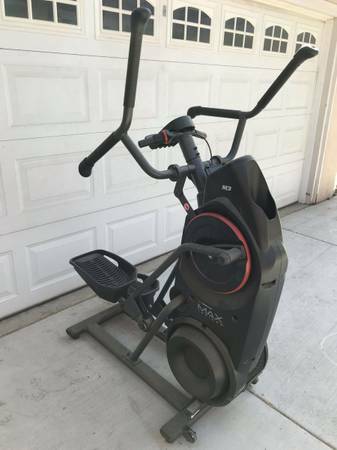 What’s amazing about this is that the M3 is even better than a normal elliptical because of its unique design. It’s not like they just slapped on two machines together and called it a day. I think we can all say that it’s so tedious to do specific workouts for every muscle group to make sure everything is in tip top shape. Not everyone has a trainer to plan these workouts for them in the first place. The Bowflex Max Trainer M3 eliminates all that by simplifying your workout. Whether you’re trying to lose weight or gain muscle, this machine is an excellent addition to your routine. If you’re always in a rush and don’t have the time to keep switching machines during your workout, then this is the right choice for you. You don’t have to do separate arm and leg workouts. It’s also designed for movement that feels more natural despite how engaged your whole body is going to be. The good thing about this is that it burns way more calories than just running on a treadmill. This is perfect if you’re trying to lose weight or tone up your muscles. The movements are aided and don’t have the same kind of harsh impact as running would on your knees. Remember, working out with exercise equipment is always going to be more efficient than just running or doing pushups because they’re specially designed to target certain body parts and prevent others from getting strained. 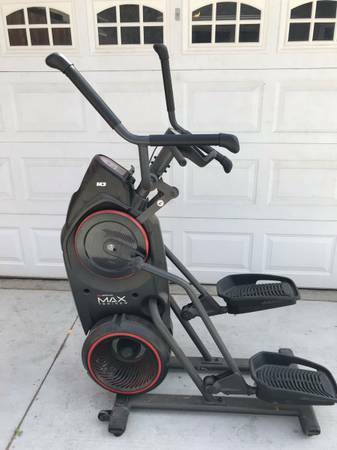 Since the Bowflex Max Trainer M3 offers a full body workout, this assures that you’ll burn a lot more calories in lesser time because your whole body is engaged. Say you go jogging for half an hour, then only your leg muscles are actually activated. Yes, this will burn some calories, but not as much as if you activate all your muscles at the same time. This is very possible on the M3. The same half hour on this machine will make you burn three times more the calories. I think that bears repeating – three times more. Working out on the M3 is going to feel different because it activates your upper body more than a regular elliptical machine. So I think we’d all agree that getting the M3 will save you a lot of time and a lot of money. Those gym membership fees add up quite a bit and you don’t always have the time to go on a hike or rock climb because who does? Exercising can put a lot of strain on your joints. This is why you should have special workout regimens if you’re a little older or you’re on the heavier side. Running, for example, targets your thigh and calf muscles, but also wears down your knees. But regardless of age and weight, joint and ligament care should always be one of your main concerns when working out because neglecting to do so will not be good for you in the long run. You don’t want to get any injuries that you’re just going to have to live with for the rest of your life. But the Bowflex Max Trainer M3 also gets rid of this problem. It has no impact on the joints whatsoever because the whole work out is supported. Bowflex made it a point to develop this machine with the body’s natural movement in mind. Without any pressure being put on your joints, it’s more likely that you can go for longer workouts and, in effect, burn more fat without ever feeling pain. Other exercise machines are bulky and can be very frustrating when you set it up. The Bowflex Max Trainer M3, on the other hand, is very sleek, can be folded to be stowed away, and is very easy to assemble. I’m sure it will look great in your basement or home gym. Additionally, the average treadmill will require two times the space the M3 does. That’s a small footprint. The controls are not complicated at all with just a turn dial to adjust resistance. You can choose up to eight levels, so it will be quite a little while before you plateau. They also include a chest strap to monitor your heart rate. You can set up two profiles, so this will be great if you intend to share this machine with someone else. There is a water holder and a big enough shelf to hold any book or tablet. So if you don’t want a head scratcher and want something straightforward and easy to use, the M3 is your best bet. There is really nothing like the Bowflex Max Trainer M3 on the market right now because it combines two workouts in one. This is a good machine for those who are looking to maintain their weight or just starting off on their weight loss journey. It’s ridiculously easy to use this machine, so you’re more likely to put the time in and work out because you enjoy what you do and you enjoy seeing the fast results. If you find yourself feeling a little intimidated by other exercise equipment at the gym, having your own M3 is as simple as it can get because it’s the entry-level model with just the absolute essential features that you’re going to need. If you use this machine for a while and want to shake things up a bit, there are a number of workouts you can follow along with on Bowflex’s YouTube channel. Yes, the M3 can go for quite a bit of money, but it’s well worth it as far as fitness machines go. It’ll be good to keep an eye out for Black Friday deals on the Bowflex Max Trainer M3.